Find and Replace (FNR) supports escape characters such as “\n”, “\t”, etc. 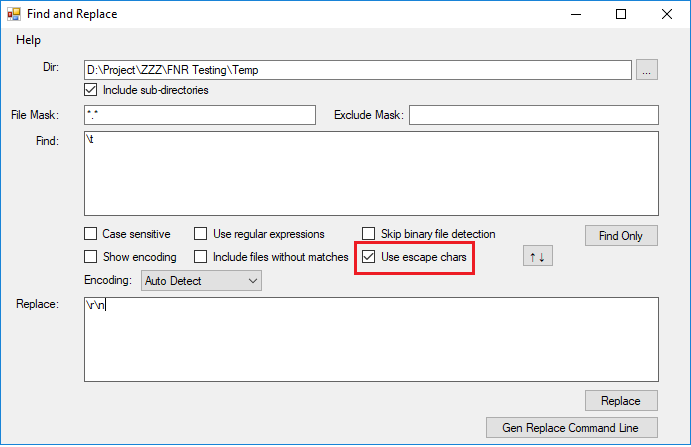 To use escape characters in your find/replace text, you need just to check the Use escape chars checkbox if you are using the UI. But if you are using the command line in batch mode then use –useEscapeChars flag. --useEscapeChars --find "\t" --replace "\r\n"
By default, when you run DOS commands, the values in arguments are limited to code page 437. How to write a batch file that has accented chars: http://stackoverflow.com/questions/1427796/batch-file-encoding/1427817. View UTF-16 or other encodings in DOS prompt http://stackoverflow.com/questions/10764920/utf-16-on-cmd-exe. One more tip is to make sure you save your BAT file in UTF-8 or another format that displays the chars correctly. Don’t use ASCII.